Saluki. She's 4 months old and loves being petted. Illini. 6 months old and also very friendly. has given my hand a few sniffs but that's about it. They are from Kinder Korner Farm and their names are hints as to where that is located. Can you guess? Saluki and Illini are very friendly, but Violet is shy and concerned about being here. She and Illini have had some pretty good hollering sessions for their moms, while Saluki was a bottle baby. What do my other girls think? The kids pretty much take it all in stride, with plenty of sparring over the log and stone steps. although there have been several "mind your elders" butts. I'm trying on some nicknames for Illini and Saluki - Linney and Luki - what do you think? Of my homeborn kids, Stella's twin sister Velma went to Illinois and one of the quad bucklngs (Buzz) has been sold. 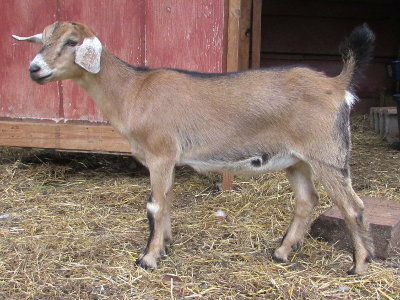 I still have two bucklings left which I will either sell if someone wants them or will be for chevon. That's pretty big news! What is your farm's prefix for the registered goats you produce? I'm loving all those colours. Not hard to tell them apart. Each is very distinct. I like their original names, but for around the farm when you have to juggle other jobs, I think Linney and Luki are easier names to run-off the tongue. Maybe even Vye can be shortened for Violet. Our cat's name is Muesli, but we call her Mew for short, or Mewsy. It's just easier. She still gets called by her proper name, not just as often. Michelle, thanks! Our prefix is Dan's and my initials, DLT. 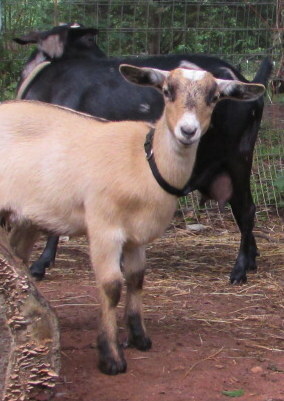 It's registered with the Kinder Goat Breeders Association. Chris, thanks! I think what you said about running off the tongue is key. Saluki is pretty fluid, Muesli is too. But Illini less so, I suppose because it's 3 syllables. Even so, I just like "Luki"! 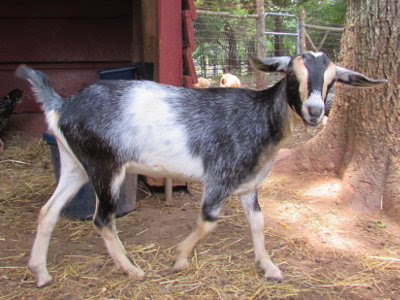 Dawn, I love the color too, and with one black buck and one mostly white, I've got a rainbow of goats! They're so cute! Eventually, we will add goats to our place. Congratulations....they look awesome. How much milk do Kinder give per milking? Glad to see them settling in. Violet was such a shy little doll. I had just got her to start eating out of my hand. Hoping she warms up to you quickly. We called them Luki and Li-Ni. Velma is doing well, and is getting used to me. So happy to have gotten to meet you and see your beautiful house. Hopefully there will be another visit in the future. Thank you, for your hospitality. Love the photos! Once again, I am living my goat dreams vicariously through you. Goats are so versatile for a homestead. We love ours, especially the Kinders! Fiona, they pretty much give about the same as a Nubian, with the top Kinder milkers at a gallon a day or so. I can't tell you how much mine give, because they each still have a kid on them. I separate at night and get about 10 hours worth, but very little in the evening. Kelsee, it was great to meet you too! I'll definitely be glad to see you again. So glad Velma is doing well. I got to thinking that her trip to the vet a few weeks before was her warm up for her long trip. That way you don't have feed to get, vet bills to pay, and mischievous goats getting into whatever you don't want them to! Yet another piece of the dream coming to fruition! Couldn't be happier for you! Very nice! Sounds like you'll have a busy summer. Can't wait for pictures. I prefer Luki myself, the nickname rolls off the tongue easily!!! Beautiful pictures of your new babes, I'm sure they'll be fine and warm up to their new friends. Illinois! My home state and quite a few good Kinder goat breeders! OK- Saluki as in Southern Illinois University mascot and Illini as in University of Illinois mascot? Something besides corrupt politicians came from here?!!!? Whoa! :) They sure are cute! So far so good! In the past I've had some goats that were pretty mean, but everyone seems to be relatively accepting. I'm thankful for that! Illinois is my home state too! Leigh - Cute. You're getting quite the respectable size herd! Nice to see someones research and hard work pay off for them. :) Thanks! So far no word, although I was recently contacted by one town councillor who hadn't seen my application and wanted to have a copy sent, and I spoke to the mayor today (not directly about my request, but a positive conversation) and I am so hopeful it will somehow go through.